Over the years, Campbell has seen startups and multinationals alike labor to perfect products only to casually raise their finger to the wind when it comes to determining pricing. 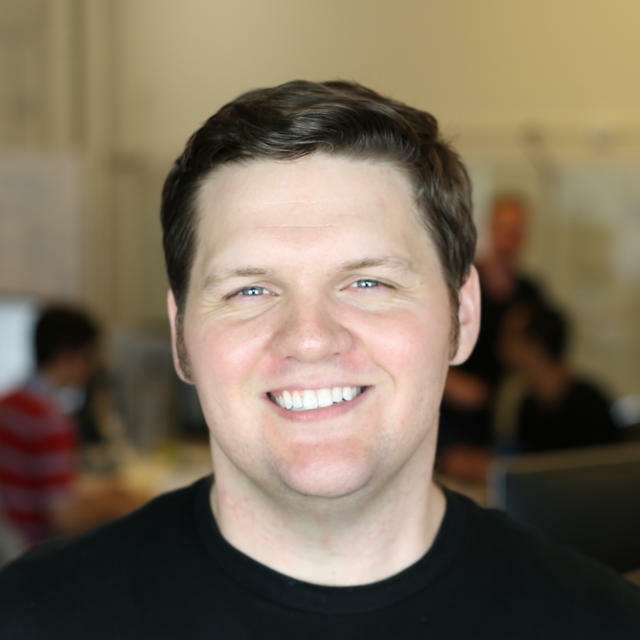 In 2011, Campbell launched Price Intelligently to help SaaS companies, such as Atlassian, Hubspot and Insightly, boost revenue from and knowledge of their users. Before that, he held strategist roles in the private and public sector: helping Google's mid-market advertisers grow their businesses via advertising solutions and serving as an Intelligence Analyst Fellow at the Department of Defense. In this exclusive interview, Campbell deconstructs and walks through the elements of a pricing strategy to enable startups to more effectively acquire customers. The foundational work behind pricing is to create, test and refine buyer personas so that they’re mirrored on your pricing page. To do so requires a three-stage process: define your customers, collect data from them and apply your findings. While these steps sound simple, the execution is not. Let’s get started. This simple naming convention may seem silly, but it accomplishes a few, valuable goals. “First, it creates a common — and memorable — language for you to easily reference your potential customer groups throughout your organization. Second, it allows you to define and stack each cohort quickly. Lastly, it prompts you to recall the diversity of your buyer cohorts. It’s easy to imagine your potential customers as a vast ocean of people; this reminds you that each have distinct preferences, values and incentives that control their behavior,” says Campbell. Startup Susan - She’s pre-revenue or hits $1M in revenue. She’s not sophisticated with her processes yet, and is mainly focused on her core product. Mid-market Malik - He’s a mid-stage company that's making $10M to $50M in revenue. He runs a team of 12 to 25 people. Enterprise Ernesto - He might generate $75M or more in annual revenue. He isn’t likely going to use the product personally, but will more often be a decision maker. These placeholder descriptions don’t need to be elaborate, but extensive enough so that you recognize them in the field. Identifying stage and behavior is a good place to start. Depending on the product, these descriptions might go deeper into what each cohort values, but the immediate objective is that your team can collectively understand each customer segment. 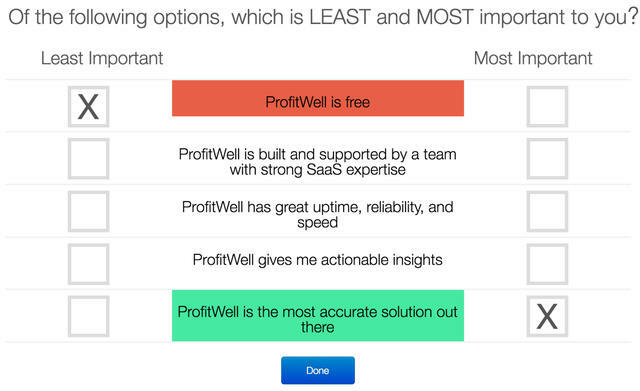 Law of the jungle: Good surveys lead to good pricing. Bad surveys beget bad pricing. Simple as that. Price Intelligently has sent upwards of 15 million surveys, and has studied what’s worked and not worked along the way. To start, Campbell recommends that you focus surveys to test two elements — features and price sensitivity — with a relative preference methodology. These should serve to test your hypothetical customer personas. 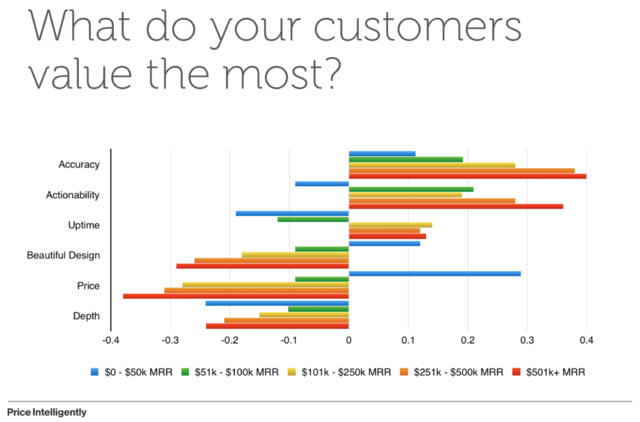 The first survey helps rank your core features to determine relative preference by customer cohort, and the second focuses on overall price sensitivity — essentially a customer’s willingness to pay for the product. Feature preference surveys. It’s a challenge to extract people’s preferences in only a few questions. On one hand, you can ask a multi-step or multifaceted question, which are often time-intensive and burdensome for people to complete. On the other hand, you could opt for a more simple, lightweight question, which may not return the depth of response you seek. Ranking questions fall into the former category and multiple choice questions fit into the latter. Out of these five features, which one is most important? Out of these five features, which one is least important? Another pitfall is blindly following traditional value metrics. “In B2B, there's this archaic belief that per user is the best value metric, because everyone sold licenses back in the day. Companies sold by the seat because they were physically given a disk or had to grant access or make a data transfer to each user,” says Campbell. “When SaaS emerged, most people naturally kept the per license or per seat model because that’s what was always done. But the challenge — and the opportunity — with SaaS is that you can be very flexible with how you’re charging." At what point is this way too expensive that you would never consider purchasing it? At what point is this starting to get expensive, but you'd still consider purchasing it? At what point is this way too cheap that you'd question the quality of it? Don’t spend more time deciding to do a survey than building the survey itself. Given the data it can generate, it’s less of a constraint than you think. 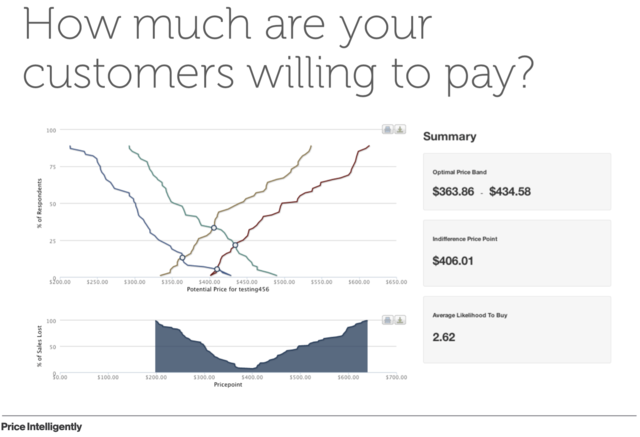 All the personas and surveys serve to fine-tune one key area: your pricing page. How you showcase and justify your pricing is the culmination of all these efforts and the lever for customer acquisition. But to get there, you need to first grasp the price elasticity of your offering. Your price is the exchange rate on the value that you're creating — everything your team does works to justify the numbers on your pricing page. 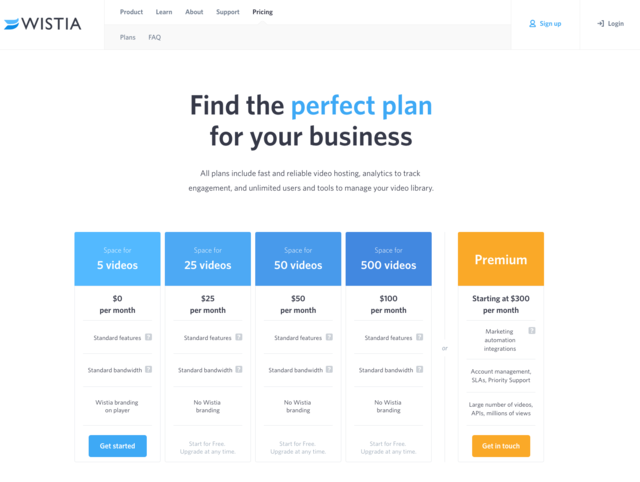 The goal of a pricing page isn't to win design awards. It should orient you like a mall map, not leave you in awe. In terms of adjusting pricing, the rule of thumb is to refresh it every quarter or two. “A lot of people get nervous to change pricing because they don't want customers to perceive that they're paying more. The truth is that people understand that products cost money, but they need to get in a rhythm of how that changes as your product changes,” says Campbell. These days it’s a mistake to chase volume. It's so much easier to make 100 people happy at a higher price than to make 1,000 people kind of happy at a lower price. If readers take one note from Campbell, it’d be to get started now. 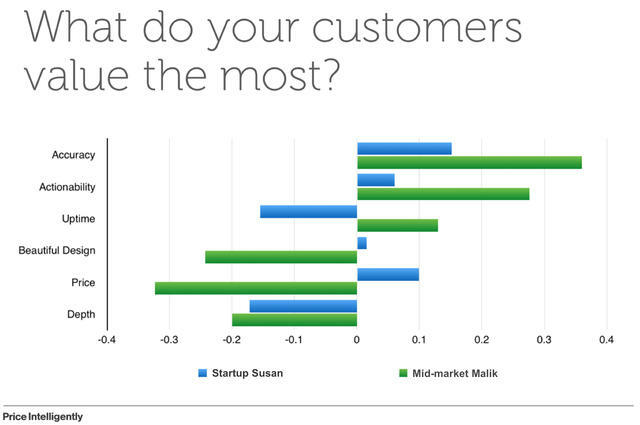 Don’t wait for your product to be done to start sending out feature preference or price sensitivity surveys. After you release preferred features, don’t get intimidated by conversations with customers about price increases. Whether it’s early and just the founders or you have heads of product, sales and marketing, whiteboard your potential customers into personas. For each profile, assign your hypotheses of their preferred and least preferred features, as well as their willingness to pay. Then test your personas with relative preference surveys — whether that’s on your own and quarterly with a few questions or with the help of companies that can offer market panelists. Apply your findings to create intuitive pricing pages so clear that your customers can see themselves in them.